The dust-scarred coal miners would never recognize it. Today’s version of the greater Wilkes-Barre area offers little resemblance to the community of the anthracite era. Modern retail fulfillment centers such as those run by Adidas and Chewy.com dot the landscape of the Route 81 corridor, while tech and service-oriented firms such as Berkshire Hathaway, GUARD Insurance, Solid Cactus, PlanGuru, Mobiniti and ENX2Marketing are prospering throughout the Wyoming Valley. Larry Newman, executive director of the Diamond City Partnership, stated a solid developmental plan utilized for over a decade is one of the reasons for the renaissance of commerce in his region. In addition to the retail fulfillment centers, solid growth is occurring within the city’s downtown, as functionally obsolete office space is renovated into downtown housing with attractive amenities. According to Newman, 205 market-rate housing units have been opened in the downtown during the last five years. The number of college graduates located in the downtown has also doubled over five years, with young college educated households comprising 20 percent of the downtown’s populace, which surpasses the national average of 10 percent. This downtown growth in housing has produced a residential base with a heavy percentage of age 35-and-under childless couples, plus a growing number of older people. In addition, there are 11,000 people working in the downtown, comprising 46 percent of all city-based jobs, and almost 8,000 college students are enrolled at the city’s schools. Further data cited by Newman indicates that working commuters who come to the downtown, according to a survey of 600 people, spend an average of $86 per person per month. City residents spend an average downtown of $120 per month. He detailed further signs of progress, such as how the mayors of Wilkes-Barre and the nearby towns now all meet to discuss best practices and ordinances. Renewed attention is also being paid to water runoff needs to reduce the dangers of flooding, utilizing a regional approach and compliance mandates. Other positive renewal activities listed by Newman include a renewal of Public Square, the King’s College rehab of the Spring Brook Water Supply building for civil and mechanical engineering, and the $8 million pumped into the Wilkes engineering program. In addition, the F.M. Kirby Center for the Performing Arts now averages a show every three days, more than 40 downtown restaurants are in operation, and the Innovation Center at Wilkes-Barre continues to assist businesses. Newman is particularly proud of the unity achieved since 2008 by administration of the downtown Business Improvement District (BID). This effort delivers economic development, marketing and promotions, and solutions to solve collective problems with actions that unite property owners without governmental reliance. The economic diversity present in the greater Wilkes-Barre area is one of the region’s greatest strengths, according to Joe Boylan, vice president of economic development with Greater Wilkes-Barre Chamber of Commerce. This organization is adapting to the modern era’s diversity by changing its focus from providing brick and mortar facilities for business to creatively delivering programs that will assist modern commercial processes. According to Boylan, 65 percent of his chamber members now employ five or fewer people. They maintain a 90 percent member retention rate that is 14 percent above the national average, and a large number of the chamber participants are striving to better understand the appetites of the rapidly rising millennials. A daunting challenge facing commerce in Wilkes-Barre, according to Boylan, involves the attraction, retention and best use of competent employees. Employee wages in the region are finally rising as the supply-demand curve for labor swings due to market pressures, and some logistics firms are paying in the neighborhood of $14 per hour to counter a growing workforce shortage. Boylan added that another business challenge involves, in many cases, the perception of Wilkes-Barre. Large numbers of talented people still do not understand the quality employment opportunities that have appeared, due to a lack of workforce awareness. In some ways, the Hazleton, Scranton, and Wilkes-Barre areas are similar in their success with tech firms, business incubators and entrepreneur development, according to Ken Okrepkie, regional manager with the Ben Franklin Technology Partners. He added that each region’s chamber of commerce, universities, and governments are striving to deliver key resources necessary for business growth, particularly with budding entrepreneurs and manufacturing within a tech-centric hub. 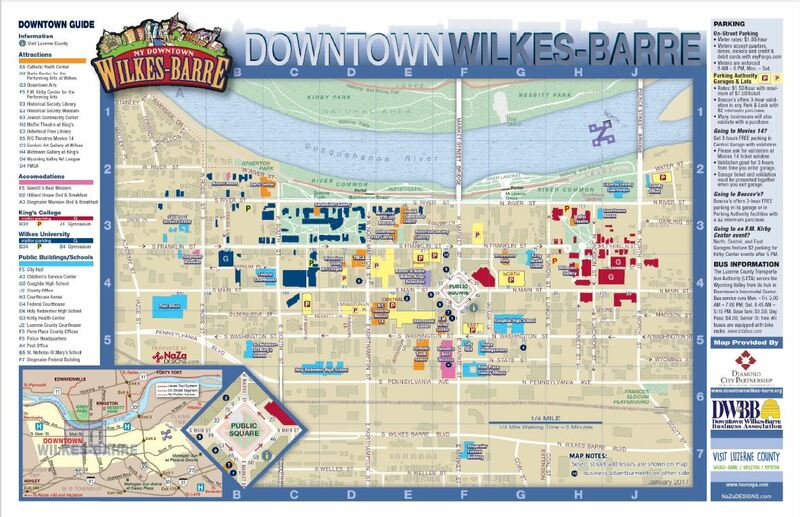 “Specific organizations such as ours, Wilkes-Barre Connect, and the Family Business Alliance at Wilkes, plus others, are all doing their parts along with the three incubators to create a support structure,” said Okrepkie. Areas of concern for Okrepkie in the unfolding days ahead now include the transportation pressure being endured by travelers on Route 81. This highway is a lifeblood for the region’s economic growth, particularly with the logistics industry, and expansion of the highway is vital to accommodate the truck traffic at peak hours if economic growth is to be maintained. Wilkes-Barre area industrial parks also must continue to enjoy effective financing for expansion, as well as quick site preparation when opportunity knocks. The same is true with the downtown, where collaboration with government is vital if the current positive energy is to be maintained. Rodney Ridley, Ph.D., director of the Allan P. Kirby Center for Free Enterprise and Entrepreneurship at Wilkes University, emphasized that the transportation council, Wilkes-Barre Connect, tecBRIDGE and the Wilkes University’s Allan P. Kirby Center for Free Enterprise and Entrepreneurship all display prime examples of developmental collaboration. Dr. Ridley also cited a mounting shortage of skilled workers as one of the region’s mounting problems. He noted that job offers now may contain once-heard-of signing bonuses, indicating a true renaissance for the regional economy as Wilkes-Barre becomes a serious player within the modern tech economy. According to Dr. Ridley, Wilkes-Barre’s stressed fiscal situation is no different than many municipalities around the country. The patience to grow tax-paying entrepreneurs is one of the keys to increasing city revenues, along with development and retention of educated workers. Solutions to any region’s workforce needs require societal shifts, according to Lori Nocito, executive director of Leadership Wilkes-Barre. She charged that American society, as a whole, is placing excessive emphasis on attainment of a four-year degree, as well as making a career choice while still in 12th grade. Nocito’s recipe for effective career awareness includes early grade-school intervention, job shadowing, matched internships, plus involvement in initiatives such as her organization’s “Community Connections,” program, which is part of the intercollegiate offerings. These techniques allow students to investigate their skills, the available opportunities, and expand their horizons as they peel back the multiple layers of careers. Leadership Wilkes-Barre also offers specific growth opportunities for its students. Included among these is a day interacting with a panel of business people to create awareness about various careers, especially those that exist in NEPA, along with the reality that job training now must continue for a lifetime through continuing education. NEPA’s largest economic sector is also alive and well in the Wilkes-Barre area. Commonwealth Health Wilkes-Barre General Hospital has unleashed a $40 million expansion and renovation project that increased the intensive care unit to 34 beds, added a helipad, and updated all equipment in support of the facility’s trauma, surgery, neurosurgery and emergency departments. The project coincided with the hospital’s re-accreditation as a Level II trauma center. The hospital is also scheduled to open its renovated endoscopy center. This addition will feature four procedure rooms, 11 pre-post-operative recovery bays and a new waiting area for visitors and family.